Cincinnati skyline, from the Ohio River. I've been working in Cincinnati for a few weeks now. It has a nice skyline, but I haven't been able to capture it properly yet. Like New York City, it's best viewed from a different state. Cincinnati is right on the Ohio River, and parts of it, like its airport and movie theater, are in Kentucky. On the east coast, they're used to this kind of sprawl, but in Cinci, they don't allow the cabs to roam around from state to state willy nilly. They can only go one way. Presumably, after dropping off passengers in the adjoining state, they are crane-loaded onto barges and shipped back for another fare. All I know is the driver who dropped off my coworker and me said he couldn't come back to pick us up later because he wasn't allowed to pick up fares in Kentucky—eight blocks from where he picked us up. The downtown area is home to the Cincinnati Bengals stadium and the Reds stadium. They're only a couple of blocks apart. They aren't very photogenic in the offf-season, tho. The fountain on Fifth Street was featured in the credits of WKRP in Cincinnati. That was thirty years ago, but the people in Cincinnati are still pretty proud of it. I like the Cincinnati airport well enough. They have far better transportation (between concourses) than, say, O'Hare. In Milton's Paradise Lost, the capital city of Hell was Pandemonium. I think of O'Hare as being modeled after Pandemonium International Airport. "Thousands of flights daily. Feel free to attempt to catch one." I'm not clear on why the McDonald's on Cincinnati's C Concourse is always understaffed, tho. 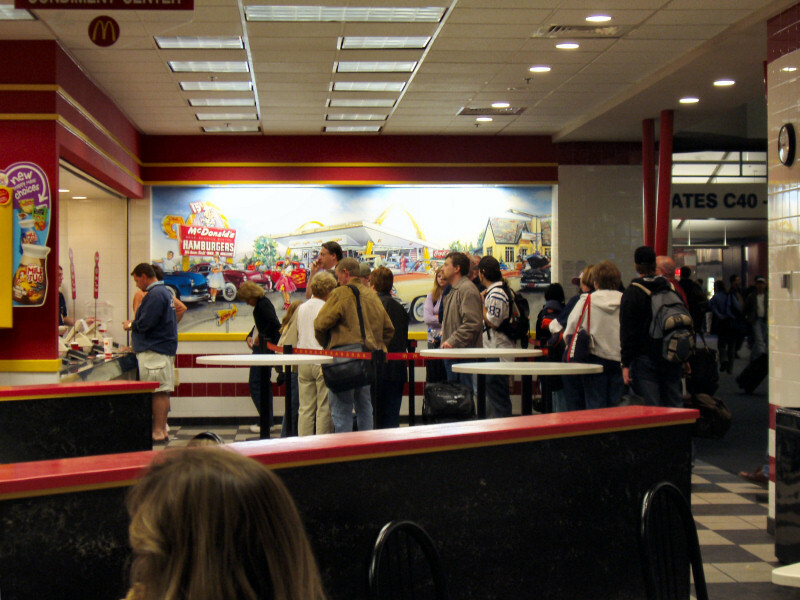 Any time of the day or night, you can see about 20 people in line at that McDonald's, shuffling like zombies toward the promise of a hot apple pie. "Sorry, we're out of apple pies." They're always out of apple pies. This McDonald's has a weird mural to complement its 1950s styling. I wish I had a picture of it. There are hot rods and dudes, a gal in a poodle skirt, and this odd black family standing next to a Corvette. Not only is it strange to imagine a black family in the 1950s that could afford a Corvette, but there are three of them: a father, mother, and adolescent son. Where does the son sit? I checked in Sunday night and decided to call the restaurant to get something to take back to my room. I don't like eating alone; besides, when it comes to service, the Hyatt's eatery is the Veteran's Administration of restaurants. But the phone wasn't working. I alerted the desk clerk and ate in the restaurant, multiple televisions blaring a mixture of sports talk and Boston Common (which, as far as I can tell from watching that one episode, is Allie McBeal without all the charming personalities). The next night, I went back to the hotel and tried to order room service. But the phone still didn't work. I went out and used the hall phone to call the service desk. Rod Serling answered, using the voice of a middle-aged woman. Me: "This is Derek Jensen in room 1932. When I checked in last night, my phone wasn't working. I mentioned it at the front desk last night, but it still isn't working tonight." "Let me look into it." Long pause. "Yes. Room 1932. The phone lines have been cut." Me: "I'm sorry? The phone lines have been cut?" I'm thinking: secret agents? wire taps? "Yes. Room 1932 is one of the rooms where the phone lines have been cut. Five years ago, new carpet was laid, and the installers cut the phone lines." Me: Long pause. "Excuse me, did you say five years ago?" Me, incredulous: "So that room never has phone service?" Me, desperately clinging to the concept of a logical universe: "But there's a phone on the desk." "Does it give a dial tone?" Me: "No. That's the problem." "Right. The phone lines have been cut." She offered to have me moved, but I just asked that she transfer me to room service, and, fifteen dollars later, I had a hamburger. Now, it occurs to me, it wouldn't be bad if the room really was set in 1932. No phone (or maybe the tall, candlestick kind, where you have to ask an operator to connect you), no clock radio or TV, and a complimentary pack of Chesterfields—and maybe a slouch hat. At the very least, your hamburger sandwich and French-fried potatoes should only cost 15 cents. Update: I've since been booked into another room, 506, where the phone doesn't work. There is a second phone in the room which does work, which makes me wonder all over again why they haven't simply removed the non-working phone. In retrospect, the same is probably true of 1932, but it didn't occur to me to check, and, in any case, the service lady didn't think to suggest checking it either. I ordered room service this week too, but something odd happened. Let me start by saying I don't like leaving a food tray in the hallway when I'm done. It's a barbaric practice invented, I believe, like daylight saving time, by the Nazis. Note: Further research has determined that daylight saving time was actually invented by the Kaiser's government during WW1. So, it was invented by people who then also invented Naziism. I didn't have any trouble last week, but this time the housekeeper ignored the tray and left it in the room. The next day, I left it on the bed, where she couldn't ignore it. And the housekeeper moved it to the desk and left it. Surely it's not the same housekeeper each day, right? I wonder if I could keep the tray for my entire stay, each housekeeper saying to herself, "Well, he's going to expect to find these cold French fries when he gets back. And he hasn't even touched this tiny ketchup bottle." Maybe next week I'll order room service every night and see how many trays I can stack up around the room. What a beautiful City! All those that come to Cincinnati and find themselves at The Great American Ballpark should consider themselves a local and cheer for the Reds! Haha.. thats a funny story about the room 1932.. anyways great picturers. Our city is tight.